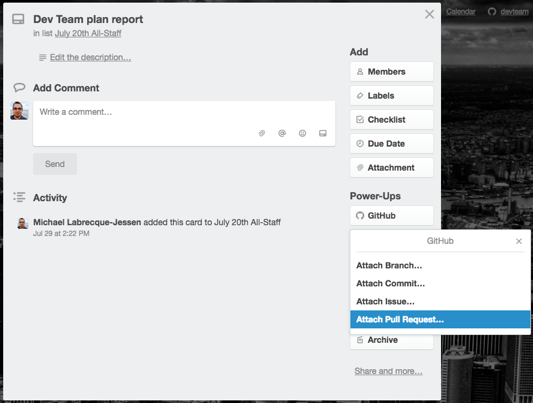 If you use GitHub, you can also use Trello's GitHub Power-Up to attach pull requests, issues, and commits directly to your Trello cards. To enable the Power-Up, open the board menu on the right side of the page, select the Power-Ups menu option, and then click the "Enable" button next to the GitHub Power-Up. After enabling the Power-Up, click on the gear symbol and then click on "Authorize Account" to give your GitHub account access to Trello. Then click "Link Your GitHub Account." 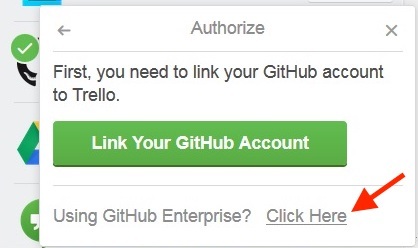 In the new window, click "Authorize application" to allow Trello to access your GitHub account. 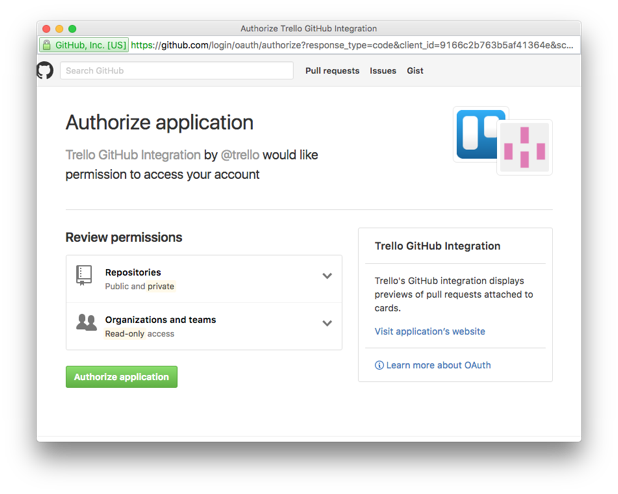 If you're using GitHub Enterprise, the steps to authenticate will look a little different. First, when authorizing, click the link for GitHub Enterprise, rather than the green button, as seen in the screenshot below. Next, a window will pop up asking for the API endpoint for your GitHub Enterprise instance. This should be the URL where your GitHub instance is hosted (e.g., https://github.yourcompany.com/) with /api/v3/ added to the end of that URL. 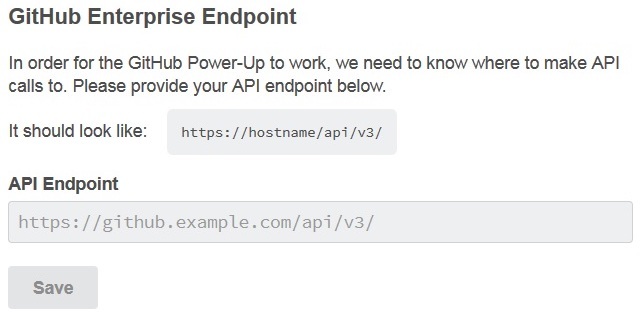 If you're not sure what your API endpoint is, check with an administrator of your GitHub Enterprise instance. Note: While we do support GitHub Enterprise, we only support instances hosted on https. We do not support GitHub Enterprise over http. With the Power-Up active, you can access it from the Power-Ups button on the back of any Trello card on that board. 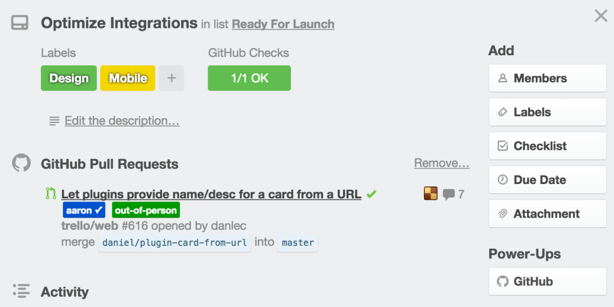 Here, you can attach a Branch, Commit, Issue, or Pull Request to your cards. Attached items will also show relevant additional information from GitHub and give you direct links to the content. Attaching a Pull Request, for example, will bring in the name of the Pull Request, whether it has passed any checks, any labels that may be added to the Pull Request, who opened the Pull Request, whether it was merged, the name of the person assigned, and the number of comments. To disable the authorization with your GitHub account, open the Power-Ups menu on the right side of the board. Then, click the gear icon next to the GitHub Power-UP and select "Remove Personal Settings". From there, select the option to clear data. You can disable the Power-Up for the board by opening the Power-Ups menu, clicking on the gear next to GitHub, and selecting the Disable button. Disabling the Power-Up will not cause any data loss. It will change the formatting of the links in the card to be the same as any other attached links. Why does the GitHub Power-Up require read-write access?